Essex Street Manchego for sale. Buy online at Zingerman's Mail Order. Gourmet Gifts. Food Gifts. 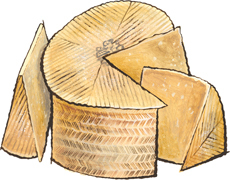 Essex Manchego is one of Spain's only farmhouse, raw milk, unwaxed Manchegos. Unwaxed refers to the rind and for the most part, cheese rinds seem to be one of those cheesemaking details that only get the attention of cheesemongers and makers. They have a tremendous effect on flavor and texture, though. The active cultures in cheese cause it to breath. It loses moisture as it ages. When the rind is waxed it holds those effects in, increasing sellable weight, but often resulting in off-flavored cheeses that taste harsh. Unwaxed Essex Manchego has a lovely, dry crumble and never tastes bitey. It goes down smooth, with the unmistakable sweetness of sheep's milk and a long savory finish that pairs well with almonds and plums and, of course, Spanish ham. An excellent cheese, made by Maria José in the dry hills of Mancha. New to America, selected just for Essex St. Cheese Co. — the same great source of our Comté and L'amuse gouda. "An artisanal farmstead Manchego in a sea of mass production"
For the past several months, this cheese has been consistently outstanding. Our current wheels were made in August 2018. They're remarkably bright and lactic with a juicy brightness, like excellent fresh yogurt. The finish grows and grows and then lingers for a long time.